TB Shipyards specialises in building all types of seagoing and inland navigation vessels, such as: pushers, water injection dredgers, day-passenger ships, fishing vessels, tankers, low-profile coasters and project cargo vessels. TB Shipyards has four different locations. Each location has its own specialty. Large and sea worthy ships are built in Harlingen and Kampen. 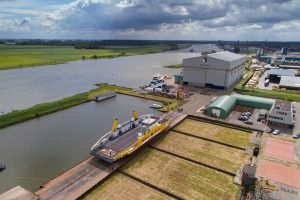 In addition to all the innovative activities and the construction of new vessels, TB Shipyards also carries out all types of repairs, maintenance work and conversions at the yards in Hasselt and Meppel. Despite the ongoing development of the yards, Thecla Bodewes Shipyards maintains some strong traditional values such as high esteem for craftsmanship, the use of top quality materials and the personal approach of our customers. TB Shipyards – Strong Quality!